This will be one of the more majestic of the Ramadan experiences as this two-tier ballroom is kitted out in traditional Arabesque patterns. To elevate the atmosphere further, guests will also be treated to a fantastic live oud performance. All of Dubai knows that the views of the Burj Al Arab are spectacular. But have you admired the iconic hotel’s interior from the plush, palatial Al Iwan atrium? Enjoy it over a traditional Arabic buffet while listening to a live kanoon and challou performance. Picture this: vast, vintage-glam décor (complete with glittering chandeliers, ice sculptures and gleaming cutlery), a terrace with sea views, impeccable service and opulent tables laden with treats that cater to all tastes. Tempting, right? Right. We suggest you book your spot early because it’s bound to fill up, fast. They’ve won awards for their Anatolian-style cuisine, made to be shared. Guests can expect a bespoke Iftar dining experience that includes traditional fast-breaking bites – like muhammara, citir kalamar, borek and pide – with mains like yogurtlu kebab and güveç to follow. Out on the further reaches of The Palm’s Eastern Crescent, the feasting stage here is set with floral centrepieces, lanterns and tea lights. After mains, from the live cooking stations, those with a sweet tooth will be well served with indulgent desserts that range from white chocolate dates to kunaffe and baklavas. Homemade Turkish treats such as traditional kebabs and hot and cold mezzes await you at this opulent venue located in Rixos The Palm. Be sure to leave some space for dessert, their Baklava is some of the best in the region. It’s not only a safe bet for the Bubbalicious brunch with family or friends. It delivers, come Ramadan, too. Breaking your fast in the breezy, cheery surrounds of the Blue Orange terrace will be a visual feast in itself. The hotel on Palm Jumeirah hosts a five-star Iftar at the brasserie-style GBR, which boasts great views of the Gulf. If you like it, you can go back for seconds in the same week, as they’ll have five different rotating menus featuring Emirati classics such as stuffed lamb harris, umm ali and kounafa nabilsy. You haven’t truly dined until you’ve had an Iftar at an award-winning restaurant in the world’s tallest hotel. This Iftar is one of three that the hotel is hosting (others are at Kitchen6 and at Al Fanous Lounge, which also hosts Suhoor). Sample a three course menu that celebrates the heritage of Indian cuisine, while showcasing Michelin-starred Kochhar’s signature contemporary twist. Another big, all-encompassing Iftar at this five-star hotel in Al Habtoor City, which is celebrating its second Ramadan. It contains all the usual stations and cuisines, although the umm ali and freshly prepared kunaffe are certainly worth your attention. Amid all the Moroccan lanterns and antique coffee pots, mini majlises will be set up in all the private dining spaces. It’s got a Best Luxury Business Hotel in the UAE award under its belt, and the service and atmosphere at the hotel’s classy European restaurant is always warm and welcoming. During Ramadan, there’ll be special themed nights that include Italian and seafood, so you definitely need to visit more than once. Proving that the Ritz puts on the glitz, each year during the Holy Month the hotel partners with the Dubai International Financial Centre (DIFC) to lay out a lavish majlis that takes guests on a culinary journey through the tastes of Arabia with its 16 live cooking stations. The only indoor Ramadan tent on Sheikh Zayed Road is offering guests a daily rotating feast that includes 17 international and regional dishes (the lamb ouzi and Fairmont’s signature shawarmas are our favourites), desserts and 26 freshly prepared salads. There’ll be hot and cold mezze on offer, too. The tent can comfortably seat 115 people, but be sure to book in advance as it usually fills up quickly. Burger & Lobster has some of the finest lobster meat around so the fact that almost the entire menu is on offer for Iftar makes it the perfect place for pescetarians to break their fast this Holy Month. Our top picks include the mini lobster roll and the half pounder lobster and chips. The beloved Mexican haunt will be ringing in its first Ramadan with an Iftar menu that is not only delicious – the churros and the short noodles served with tomato, chipotle sauce and fried plantain are a must try – but also aims to give back to society. For every Moonlight Mocktail ordered, AED10 will be donated to the Jalila Foundation – an organisation that aims to transform lives through medical education and research. American seafood restaurant Catch have finally, er, caught on to the fabulousness of the Iftar feast, and are offering their first curated Ramadan menu this year. Break the fast with dates and soup, smoked edamame and mezze bites, before trying their lobster roll and short-rib tacos, or one of the mains like herb-roasted branzino. This glamorous spot is always worth a night out. Book a window table to marvel at the stunning floor-to-ceiling views of the Burj Khalifa, then make your way through the chef’s special seven course Iftar menu that features contemporary British-Indian dishes like yoghurt chaat and keema kaleji shepherd’s pie. 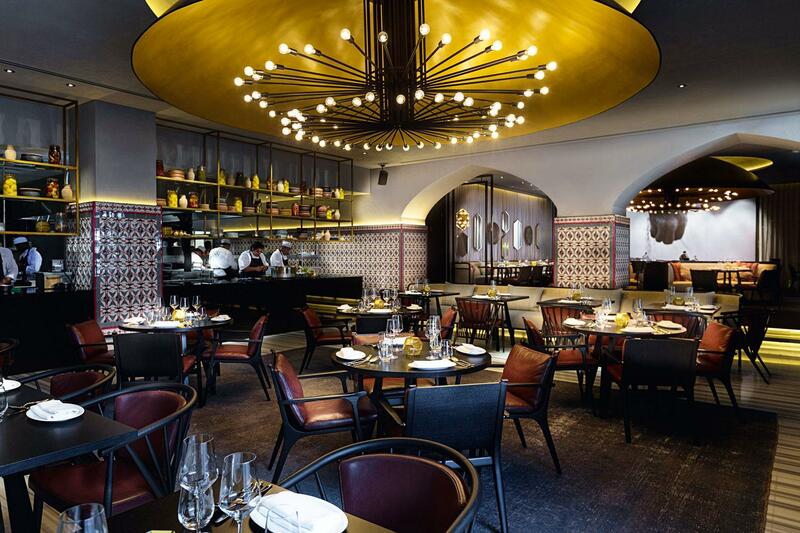 The Argentinian hotspot will be hosting a three course meal in honour of the Holy Month. The menu consists of sharing starters like Ecuadorian ceviche and beef and humita empanadas. While ancho ribeye, gambas skewers and chicken Milanese all feature,too. If you have a sweet tooth, we highly recommend the coconut tres leches – not only delicious but it is incredibly refreshing, too. The lavish venue will be celebrating its first Ramadan with a specially crafted Suhoor menu. The à la carte offering will include traditional Middle Eastern dishes as well as a number of Connolly’s signature dishes such as the duck fat chips and the whipped feta salad that’s served with watermelon, strawberry and tomato. Serving a selection of Argentinian cuisine, indulge in a selection of menu highlights such as premium cuts of meats that are made to order on an authentic chargrilling parrilla. There’s an open grill in the centre of the restaurant that gently gives off the alluring barbecue smells that are sure to tempt the taste buds. 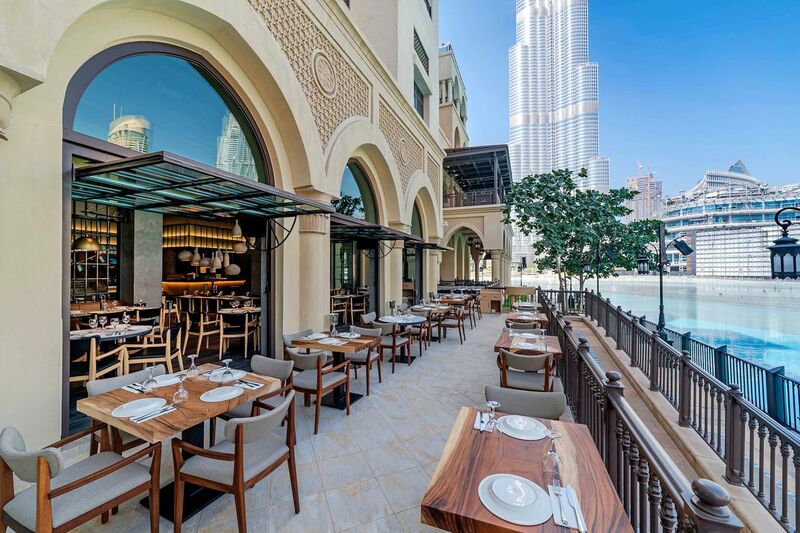 A special set menu for Iftar will be present, along with front row seats to the fabulous waterworks of The Dubai Fountains and the towering Burj Khalifa. Traditional and modern luxury merge seamlessly at this regal locale right in the heart of the Old Town Island, Downtown. The boutique hotel’s fancy ballroom will put on sumptuous Iftar and Suhoor spreads, featuring favourites of the Holy Month. Superstar chef Yotam Ottolenghi once said Turkish cuisine is “one of the most exciting and accomplished in the world”. Visit Turkish steakhouse Günaydin and you’re sure to agree. The Iftar includes a decadent buffet of salads and soups, mezzes and meats – like the satisfying fıstıklı kebap (lamb kebab with pistachio). Embracing the spirit of giving, 3in1 is offering diners a sharing style Iftar menu that includes the likes of lamb ouzi, chicken shish taouk and lamn kofta. For dessert, you have a choice of umm ali, baklava crème brulee and the venues signature karak chai pannacota. With four live cooking stations dishing up everything from ouzi to shawarmas and saj, you’ll definitely find a dish that will tempt your taste buds at The Courtyard’s Iftar offering. Before taking to the stations, guests will be treated to a selection of hot and cold mezzes and soup. Two main courses and four skewers will be served directly to the table, too. Make yourself comfy in the Arabic-style courtyard setting, where you’re welcome to play board games and smoke shisha into the early hours. Price: AED195 buffet, soft drinks and Ramadan beverages. It’s all about regional heritage here, as the restaurant draws from the rich culinary history of Jordan, Lebanon and Syria and dishes it up with the warm and traditional Arabic hospitality. After your lavish Levantine spread and to-die-for dessert selection, try an exotic shisha flavour outside. These two restaurants have combined to deliver an Iftar that includes regional favourites like lamb ouzi, chicken biryani and hot and cold mezzes as well as international fare such as mixed grills, pastas and salads. It’s designed to bring families and friends together for a truly memorable evening. One of the UAE restaurants by Vineet Bhatia – one of the first Indian chef-restaurateurs to earn a Michelin star – Ashiana always delivers when it comes to gourmet Indian food. For Ramadan, chef Vipin Kala has curated a four course menu that includes the likes of chicken tikka masala, lamb rogan josh, mixed kadai vegetable and dal tadka tamatari. Michelin starred chef Alfredo Russo has prepared a number of dishes that blend Italian flavours with Arabic cuisine in honour the Holy Month of Ramadan. Our favourites from the sharing style menu include the lamb served with chickpeas and rosemary, the black rice served alongside spinach and mozzarella as well as the salmon served with parsley and mint pesto. At this uplifting spot overlooking the Raffles gardens, chef de cuisine Mazen Abdallah will ensure that you have any dish that your heart may desire. There are stations serving Ramadan beverages, shawarmas, mana’eesh, soups and roasts, Indian and Asian options, and traditional mezzes and sweets. Head to Crossroads afterwards where the shisha sommelier will mix you a special blend. A lavish Turkish Iftar that incorporates a night bazaar featuring Turkish goodies from jewellery, clothing, home décor and food. For breaking your fast, there’s a generous array of mezzes and salads, pide, charcoal grilled meats and fish. To finish, there’s the incredible sweet room featuring dondurma, baklava and more Turkish delight than you know what to do with it. If that’s not enough, you can relax on the terrace watching Turkish soap operas whilst taking in a range of shishas. This one ticks all the right boxes: ambience provided by an oud player and lanterns? Sure. Classic Arabic tastes, like lamb ouzi, fatteh and mixed grill, mezzes? Check. A range of Ramadan beverages? Yup. Traditional sweets, like umm ali and kunaffe? Sorted! There’ll be an international spread showcasing the very best that India, Italy and Morocco have to offer, too. Need the right place to host a fun loving family Iftar? The setting and hospitality at Ranches Restaurant is warm and welcoming, so it should make a memorable night out for all the family. The décor and food offering pays homage to the region while the surrounding greenery makes for nice a change from the somewhat harsh cityscapes that we’re used to seeing across the emirate. Dubai’s first ever floating Iftar and Suhoor is taking place above the luxurious QE2. The purpose-built majlis on the ship’s deck can host up to 250 guests and will serve up an array of traditional cuisine through buffets and live cooking stations. Iftar is sunset until 9pm (AED250) and the Suhoor buffet is 9pm-1am (AED175).